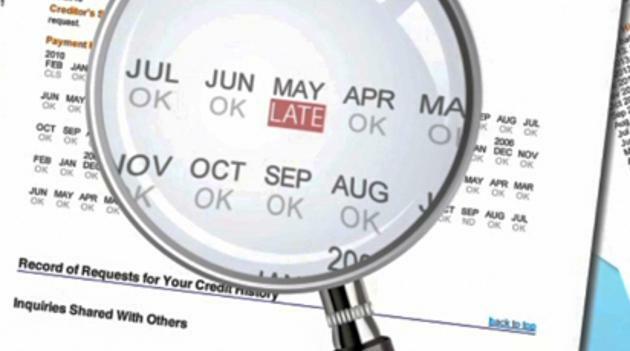 Did you know that something as simple a forgotten late fee could impact your credit score and cost you for years to come? Yahoo Finance's Vera Gibbons explains how. Credit reporting bureaus started offering free annual credit reports to consumers more than a decade ago. But few consumers — 4% of Americans, to be exact — ever bother to take advantage of this financial resource. Part of the problem is that credit reports were never designed with consumers in mind. From Day 1, credit bureaus have had one primary customer: experts at banks and credit lenders who have been trained to understand them. Until now, the average Joe has pretty much been on his own. CreditKarma, a consumer finance and credit monitoring website, is trying to offer consumers a more accessible, plain-English version of the bureaus’ credit report. On Wednesday, the site becomes the first to let users view their credit report for free as often as once a week. The site takes consumers’ complete credit history from TransUnion, one of three main credit reporting bureaus, and creates a color-coded, streamlined report, one it hopes is easier for consumers to digest than the traditional credit report. “We’ve added educational links and spent a lot of time rejiggering the credit report to make it more contextual,” Lin says. CreditKarma is one of a handful of sites, including Credit.com, CreditSesame.com and Quizzle.com, that already offers a free credit score. But without a credit report, it can be difficult to understand exactly what goes into calculating a credit score. A credit report tracks all the major details of a person’s credit history from the minute they take out their first loan or credit card — the total number of credit cards, credit balances, missed and on-time payments, inquiries about new credit, etc. Credit bureaus then take that information and use it to calculate a borrower’s overall creditworthiness, which is reflected in the final credit score. The FICO credit score is the most common score used by lenders, and it ranges from 300 to 850. The lower the score, the less likely banks are to want to lend to you. If they do take a gamble on you, you’ll likely get hit with higher interest rates than someone with a better score. When you log onto CreditKarma.com, you’ll get a list of the most recent activity in your credit history, including a handy toolbar that lets you find the kind of activity that can be most damaging to your score — for example, accounts that show missed payments, credit cards with the highest utilization rates, accounts that have been sent to collections, and recent credit inquiries. If you don’t understand what each section means, a brief explanation is included. Unlike a traditional credit report, which doesn’t include a credit score at all (you have to pay separately for that), the Credit Karma report puts your credit score front and center. It’s a helpful way to get more context, since it not only tells you your score but actually explains how each piece of your credit history has impacted it, for better or worse. The new feature seems like a convenient way to monitor your credit report activity on a weekly basis for free. As many as 21% of consumers might have an error on their credit report that could potentially harm their credit score, according to an ongoing study by the Federal Trade Commission. Errors can not only ding your score, but also make it harder to qualify for new credit and even get a job. On top of that, identity theft is a fast-growing threat — it was the number one source of FTC consumer complaints in 2013 — that can hurt your score. The best way to avoid any trouble is to be on top of your credit history and immediately dispute inaccurate information. You can do that by ordering your credit report for free the old-fashioned way — via Annualcreditreport.com — but additional donwloads can cost up to $11.50 each. Credit Karma is removing the cost and making the credit report easier to navigate. However, there are a couple of drawbacks. If you find any potential errors on your report, you can’t dispute them through Credit Karma’s site. The site will direct you to TransUnion, where you’ll have to sign in and dispute the claims through their system. CreditKarma makes it easy to download your report for free once a week, but checking your history that often isn't necessary. Banks and other lenders typically only report new activities to credit bureaus once a month, according to Debt.org. Additionally, TransUnion is only one of three credit bureaus that keeps a record of your credit history; the other two are Experian and Equifax. To be certain your information is accurate at all three bureaus, you need a report from each. Have a burning question about credit? Drop us a line at yfmoneymailbag@yahoo.com.